Zailuni discovered she was HIV-positive while she was pregnant with her second child. After she fell ill, the father of her child stopped providing support and Zailuni lost her home, all of her resources and, as she said, "all hope of living." 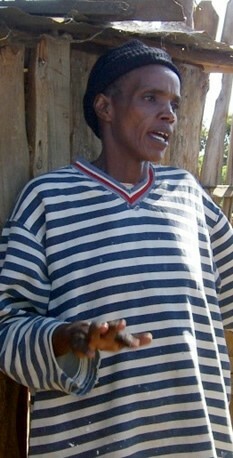 After she was hospitalized, Zailuni became a patient of AMPATH and began anti-retroviral treatment. As she grew stronger, an AMPATH social worker referred Zailuni to the program's Family Preservation Initiative (FPI), where she attended business classes for two months. Zailuni joined a group of six members in a collective Grameen Bank-style micro-credit system run by FPI. Once the FPI business development officers determined they were ready, the first two persons in the group (chosen by the group) received their loans. One round of initial savings (about 500 Kenyan shillings, approximately $7) was given to Zailuni for the construction of a stand to sell items in front of her house. This enabled her to start generating a small amount of income. With a second loan of 40,000 Kenyan shillings (about $58), Zailuni bought stock for the shop. Since her start, Zailuni takes her shop’s income and invests it right back into the business, building a better kiosk, replenishing stock and paying back her loans. And now that she’s experienced financial independence, she’s aiming even higher, with a vision to eventually become a wholesaler.